This is my tamale grocery list for our annual Tamale Fiesta. We finally tried to document what we purchased so we weren’t guessing every year, like we’ve been doing the past few years, and my mom and dad still do, as long as I can remember. So, this is for them too. The grocery list makes enough tamales to feed Pancho Villa’s army. We fed about 75 people at this year’s party and still had leftovers. But, they were fairly small tamales that fit in our mid-sized Chinese tamalero (a dumpling steamer that we bought in Chinatown. It works perfectly for making tamales). We have the mid-sized one because it can fit on the small 20” stove in our New York tenement-building apartment. My mom and dad have the large tamalero (also a Chinese dumpling steamer), but they have a standard 30” stove. So, their tamales are little larger. Southwestern tamales are typically smaller than the larger ones made in other parts of Latin America. They are corn based – corn masa, with rich filling, and wrapped in cornhusks. We enjoy fresh masa made by a couple in Queens, NY who grind their own corn in a molido they brought from Mexico, and mix it with milk and butter (you can get it with lard, as well). They deliver right to our apartment. My mom and dad also enjoy freshly made masa from a Mexican grocer in Santa Ana, CA. We stand in line during the holidays to buy the masa with other Mexican-Americans and local Mexicans who carry on the holiday tradition of making tamales every year. Fresh corn masa is the best. Anyway, I recommend making all of the tamale fillings the day before you’re going to make the tamales to let the flavors blend (make room in your refrigerator). And, mostly, to get some rest before the actual tamale making begins. An option is to add a 7 oz roll of goat cheese (queso de cabra) to the queso fresco. The goat cheese is very flavorful, which adds another dimension to the calabacita. Finally, note that the quantity of herbs, spices, and seasonings used above are approximate. Use your taste buds to test flavors. 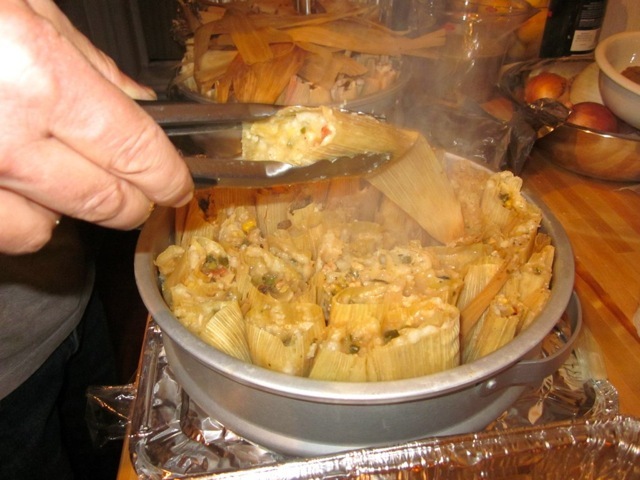 Hone your own skills to develop the flavor of the tamale filling that you want to serve.